Nearly three of every one thousand babies are born with some form of hearing loss. In most cases, however, hearing issues aren’t discovered in children until they are at least two years old. The first two years of a child’s life are hugely important in physical development as well as in forming emotional, learning and communication skills. Because of this, babies with moderate to severe hearing loss often experience major developmental setbacks. Newborn hearing loss is very difficult to detect, which is why many cases go undiagnosed until the child reaches talking age. Often, the only way to identify and treat a hearing loss problem when it truly counts is to take your baby to an audiologist for an infant hearing screening. Auditory Brainstem Response (ABR) testing is frequently used to screen newborns for hearing problems. It measures the response of a baby’s hearing nerve using electrodes. 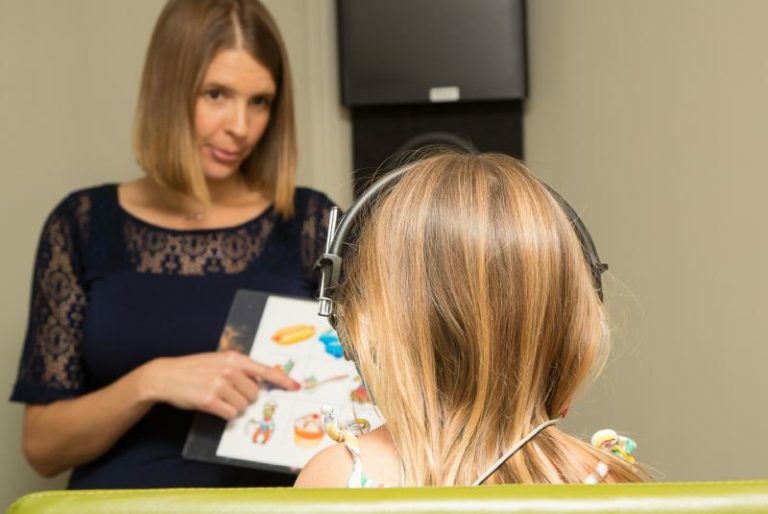 An auditory brainstem response (ABR) provides the audiologist with information on a child’s inner ear and the neuronal pathway that connects the ear to the brain. Electrodes are placed on the child’s head to record brain activity in response to sounds. Otoacoustic Emissions (OAE) testing uses a microphone and earphone to calculate an infant’s hearing abilities by measuring the reflection of a sound’s echo as it passes through the ear canal. Otoacoustic emissions are the sounds given off by the inner ear when stimulated by sound. This test is used to determine if there is damage to the hair cells that line the cochlea. Since the emissions are nearly inaudible, a small plug is placed into the ear in order to detect the ear’s reaction to a series of clicks. This test is objective, making it is a useful addition to newborn hearing screenings. When testing middle ear function in infants and young children, audiologists typically rely on either tympanometry or acoustic reflex testing. The acoustic reflex test measures involuntary muscle contractions of the middle ear and is used to determine the location of your hearing problem (the ossicles, cochlea, auditory nerve, etc.) as well as the type of hearing loss.